Morningside wrestling coach Tim Jager talks to Bob Seger after a match. 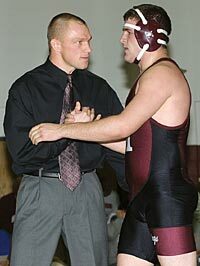 When Morningside College asked Tim Jager in September 2003 to head up the Mustangs’ new wrestling program beginning last year, the former Buena Vista University assistant coach knew he’d have some recruiting to do; Morningside hadn’t had a wrestling program since the 1978-79 school year. Jager, however, felt ready. During his three years with the Beavers, Buena Vista – a perennial NCAA Division III national power – produced nine All-Americans and a pair of Top 10 finishes in the team standings at the national tournament. Jager also had served under legendary coach Al Baxter, a 1969 Morningside graduate and member of Morningside’s M-Club Hall of Fame. Jager’s time spent recruiting high school seniors paid off. Freshman Jake Stevenson’s individual championship at the Central Region Tourney tied Morningside with Newman University for sixth place in team standings, and six of Jager’s team members – all first-year wrestling students – are headed for the 48th Annual NAIA Wrestling National Championships held this weekend at the Tyson Events Center. This weekend, between 230 and 240 wrestlers will vie for the national title. According to tournament director Tim Tushla, a staggering 420 college wrestling programs have been dropped throughout the country since the early ’70s. Tushla – who in the past has organized international wrestling events at Briar Cliff – says he’s working to help bring the sport back. Jager attributes the interest to parental and family involvement. Fans are also helping to give the sport a comeback, and Tushla says Sioux City is a great location to give it that needed boost. Morningside is one of five teams added this year, and two or three more are expected next year. The last NAIA wrestling tournament held in Sioux City took place more than three decades ago, and Tushla credits the city’s hard work for bringing it back this year. The first wrestling session begins Friday morning at 10 a.m. and by the end of the day, the top eight placers – the “All-Americans” – will be known throughout the United States. The event’s locale is particularly significant to Siouxlanders this year, and specifically to six Morningside College wrestlers and their families. Jake Stevenson wrestled for Boone Central High School in Petersburg, Neb., when Jager recruited him for the Morningside team. Jake Stevenson, a 2004 graduate of Boone Central High School in Petersburg, Neb., was ready when Jager came calling; as a junior, went 31-8 and placed fourth in the Class B 152-pound. division of the state tournament and posted a 32-4 record en route to a third place finish in the Class B 171-pound. division of the Nebraska state tournament as a senior. “It’s the biggest meet I’ve ever been to and the most prestigious,” Stevenson said of the upcoming NAIA national event. At the Central Region Tournament, Stevenson pinned Abel Brujillo of William Penn University in 5:28 in the semifinals. The win against Brujillo came against an opponent ranked third nationally in the NAIA. Though modest about his past accomplishments, the Morningside freshman attributes his successful wrestling skills to his father, mother and Coach Jager – all of whom he refers to as his role models. Jager says Stevenson’s regional tournament win will give the freshman not only a good seat but also a good draw at the national tournament. Freshman heavyweight Nathan Ploen, a 2004 graduate of Woodbury Central High School, compiled a career record of 123-50 as a four-year varsity letter winner and, like Stevenson, is quick to credit his family for his success. Morningside’s four other national qualifiers include Jared Pickett of David City, Neb., Josh Curry of Ponca, Neb., Shea Minor of Council Bluffs, Ia., and Pierson, Iowa’s Kiel Ploen – a cousin to Nathan Ploen. Briar Cliff University wrestler Jeremiah Pottebaum is ranked No. 1 in the NAIA Central Region Ratings after winning the Central Region Tournament in February. In addition to the Morningside students, Briar Cliff University Junior heavyweight Jeremiah Pottebaum also qualified for the NAIA National Championships. The Bronson, Iowa, native and former Iowa State University student is ranked No. 1 in the NAIA Central Region Ratings after going 4-0 and winning the Central Region Tournament on Sat., Feb. 19. Pottebaum earned 13 letters for the Eagles of Lawton-Bronson – four each in wrestling, football and track, and one in baseball – and qualified for the state wrestling tournament as a sophomore. He was named this year as Briar Cliff’s team captain. Siouxland’s finest wrestlers are ready to take them down.